Choose any two from our selection of gourmet jams, butters, preserves or fruit spreads for this Jam & Biscuits Gift Crate. We add a bag of our Buttermilk Biscuit Mix, all packaged in an attractive wooden gift crate for a thoughtful and flavorful gift. Berry Sweet with a little heat! Real Raspberry flavors for the raspberry lover! Everything Blueberry! Add 6 Thunder Muffins to our Blueberry Bliss box! A big box of Blueberry Deliciousness! A Sweetheart Basket with a heart-red theme! Six of our flavorful jams, butters or spreads! 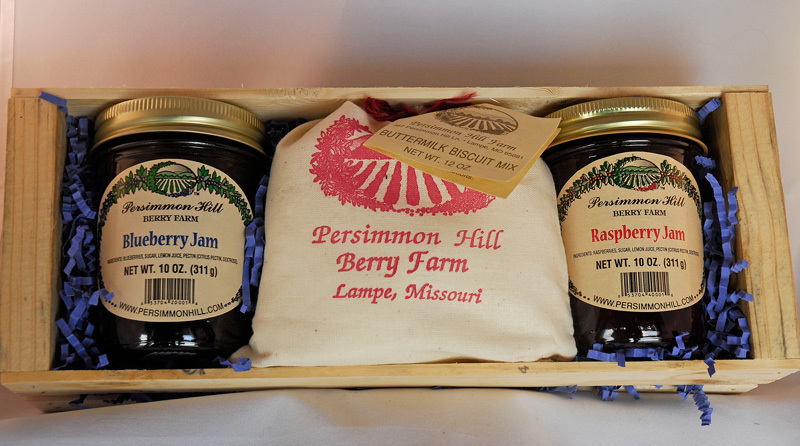 Three unique grape jelly flavors, the best of Missouri wine country! Three of our Jams, Butters or Spreads, and more biscuits! Two bottles of our award-winning berry BBQ Sauces! A Gift Crate with two of our blueberry syrups! A gift crate of 3 delicious Blueberry Syrups! The Whole Farm: 36 delicious products in a large gift basket! A dozen of our jams with three bags of biscuit mix - a jam-lover's heaven! Select three of our artisan jams, butters, preserves or spreads. Six of our gourmet jams, butters or spreads, plus two bags of biscuit mix. Three BBQ sauces, with real berries - a perfect gift for the griller!